A family from Muskogee, Oklahoma, caught a man mid-burglary, attempting to clean out their house. Robert Felts’ 17-year-old son awoke late on Monday morning to find a stranger asleep on their couch in their home. Felts said his startled son checked with mother to see if anyone was supposed to be there. She told her son to get his brother and get out of the house. The boys’ mother rushed home. “By this time, he’d got up off the couch and was sweeping the kitchen floor,” Felts said. 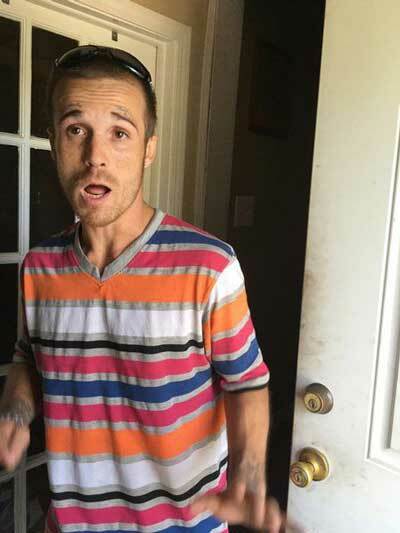 “So, he was very high and disoriented on drugs.” Muskogee Police Department spokesman Lincoln Anderson said by the time the mother arrived home, the man had shut and locked the door. He then fled from the house, taking off on a bicycle. Felts, after leaving work, later caught up to him on a nearby street. “He got away from us again,” Felts said. “Somebody came rolling up in a car and he jumped in and they ran off.” The car was a light brown, or champagne-coloured 2007 Chevrolet Impala, Felts said. After he got away, Felts returned home to talk with law enforcers. His wife, Wendy Felts, snapped the alleged burglar’s photo during the ordeal. “No one was hurt, praise God,” Robert Felts said. “Luckily, he didn’t get hurt. My wife pretty much figured out right away that he was under the influence.” The man left a small bag at the Felts’ home, in which police found drug paraphernalia. Felts said that the suspect did not finish the sweeping. The man has not been arrested, Anderson added.